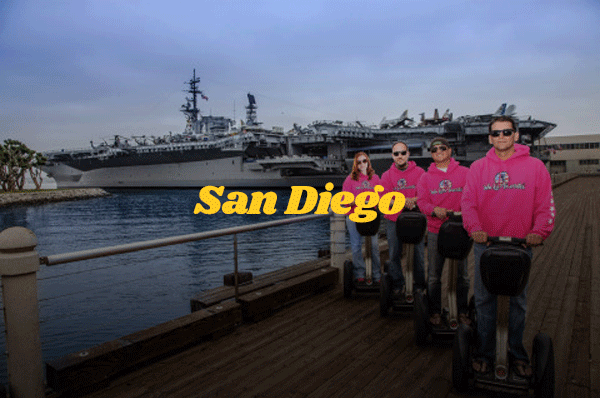 For a great way to see San Diego’s top attractions, look no further than We Love Tourists Segway tours for an experience you’ll never forget. Our Segway tours in San Diego, CA, are perfect for both beginners and experienced Segway riders looking for a fun, unique way to see America’s Finest City. These self-balancing machines are safe and very easy to learn; if you can stand, you can ride! Whether you’re visiting San Diego for the first time or you’re a local resident, we’re sure you’ll learn a thing or two about the city that you didn’t know before. We Love Tourists Segway tours are available in several tour packages including, La Jolla Segway tours, downtown San Diego tours by Segway, San Diego city loop, Balboa Park, and Gaslamp Harbor. If you’re interested in seeing a specific site, we’re happy to customize a tour for you and your group. 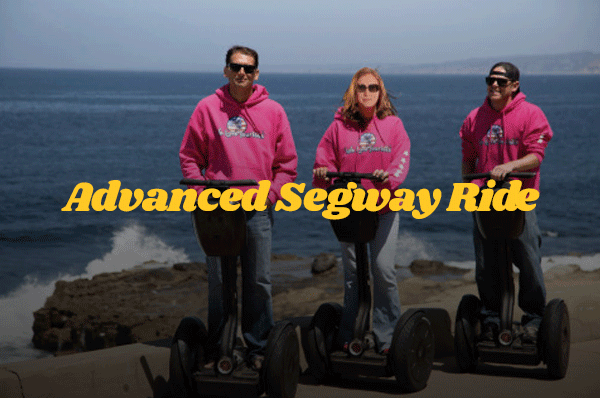 Explore San Diego by day or night with our expert tour guides and your very own Segway! And don’t forget to bring your camera to capture some amazing memories! At We Love Tourists, we strive to provide you with unforgettable adventures. For more information on our Segway tours in San Diego, CA, or if you’re ready to book an appointment, contact us at 619-512-3491. Looking for a fun relaxing way to see Downtown San Diego all lit up? Our 1.5 hour segway tour is perfect! Our evening Segway tour route utilizes wide walkways that avoid the crowds while letting you enjoy the night air. Cruise past the Gaslamp Quarter, Petco Park, San Diego Harbor, and the USS Midway museum. All segways are outfitted with a head light and tail light for this adventure. Did you know that Balboa Park is the nation’s largest urban cultural park, and it is actually bigger than Central Park in New York City?! On this spectacular Segway i2 Tour you will drift through almost 1,200 acres of splendiferous history and culture. San Diego’s infamous Balboa Park is home to 15 major museums, renowned performing arts venues, the Spreckels Organ Pavilion, the Balboa Park Carousel, the Cabrillo Bridge, the International Cottages, over 13 beautiful gardens, multiple recreational facilities, the famous Balboa Park Fountain, the extraordinary San Diego Zoo and so, so much more. As you coast through the wondrous culture and beauty of a landscape that is sure to persevere for decades to come, our experienced tour guides will give you the inside scoop and history, as well as guide you through the trails we cover that are unique to our routes and away from the beaten path. This is truly a beautiful and memorable way to experience this must see San Diego attraction. Journey through an in-depth fun narration of the beautiful Historic Gaslamp Quarter as well as the San Diego Port/Harbor. We will see the timeless gas lanterns, Victorian-era buildings, Petco Park, the San Diego Convention Center, Seaport Village, Tuna Pier, the USS Midway, and many more of Americas Finest City’s attractions. 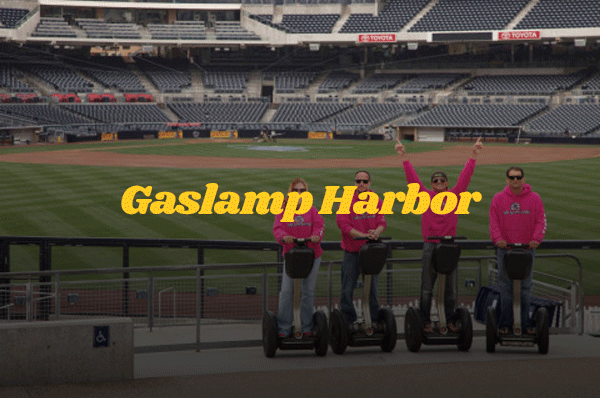 While gliding through the streets of beautiful downtown San Diego, you will explore and experience a Segway tour of the Historic Gaslamp Quarter and San Diego Port/Harbor like you have never encountered before. On your journey you will see the timeless gas lanterns, and learn about what San Diego was like when Wyatt Earp’s saloons existed. You will take in the beauty of the Victorian-era buildings, and see how our city has preserved these historic sites. You will roll through the “Park at the Park” at Petco Park, the proud home of the San Diego Padres, and see and learn about the brand new and stunning San Diego Central Library, the San Diego Convention Center, and Seaport Village. 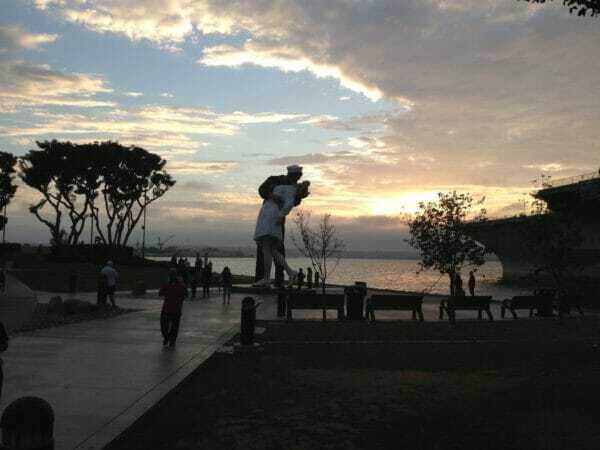 You will whirl by the public art at the San Diego Port, be able to visit Tuna Pier, and see the infamous USS Midway. All of this, and many more timeless features of what downtown San Diego has to offer will be experienced in a fun and unique way that no other tour can offer. Whether you live in San Diego or are visiting America’s Finest City, this Segway tour is sure to teach you little known and curiously interesting facts about the history and modernization of a city that has deservedly earned its reputation for being one of the top tourist destinations in the country. La Jolla, California, a northern suburb of San Diego, is an affluent and richly preserved culture with an integral history of its own right, and the unique La Jolla Segway Tour that We Love Tourists provides showcases just that. While you sail through the steep and wondrous hills right by the picturesque Pacific Ocean, you will learn how this beautiful area has become one of San Diego’s most popular tourist destinations. You will gain knowledge of the beautiful architecture, the popular downtown shopping district of La Jolla Prospect, where Dr. Seuss gained inspiration for his books, and the historic and current beauty of La Jolla Shores. Additionally, you will learn interesting facts regarding natural California sea creatures, such as what wildlife lies right on and off of our shores, see first-hand the difference between a seal and a sea lion, and learn the history of the Children’s Pool, as you roll right up to the edge of the ocean and experience it for yourself. See the first established buildings in La Jolla and how they are standing now, and so much more – and do so all while having the undeniably relaxing smell of a beautiful sunny ocean day before you. Includes San Diego Harbor, Downtown Gaslamp District, Petco Park, Balboa Park, and more! 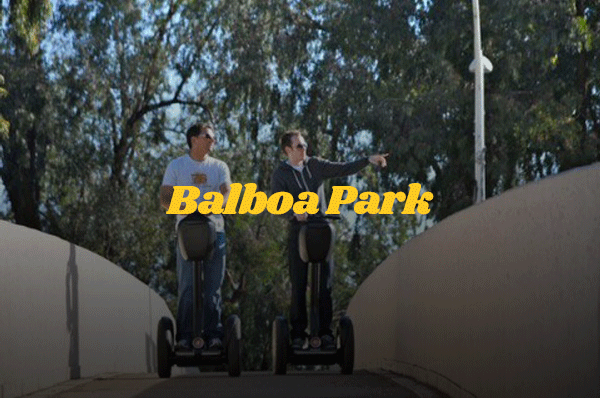 Get the highlights from both our Gaslamp Harbor Tour and Balboa Park Tour, zipping along quickly as we cover a lot of ground making the best use of our Segways. Have you previously been on a Segway Tour, loved the experience and wished you could just let loose and go as fast as you can?! Try this La Jolla route that has us flying around at full-speed for pretty much the entire tour!! Top speed glide all the way up to the highest point in City of San Diego atop Soledad Mountain, all the way down to Birdrock, and back through La jolla. INCREDIBLE views and a thrilling Segway ride pushing max speed. This one is all about enjoying quick open air riding and amazing views. Must be comfortable riding and maneuvering a Segway a full-speed, and have previously taken any Segway tour.